Have you noticed those cute little foam eggs at the dollar store lately? Every year they have them around Easter, and every year I have bought a pack while the crafty part of my brain has wondered… How exactly am I going to use these? Until now! 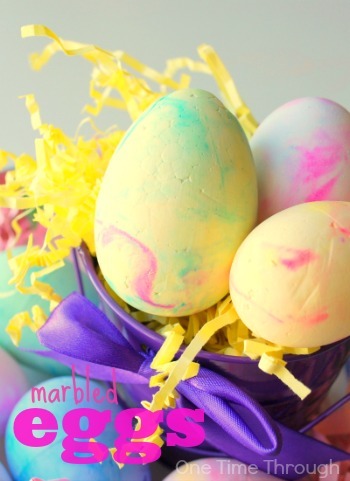 Today’s post will show you how to make some beautiful marbled foam eggs with your kids that you can use for a variety of decorations for Easter. 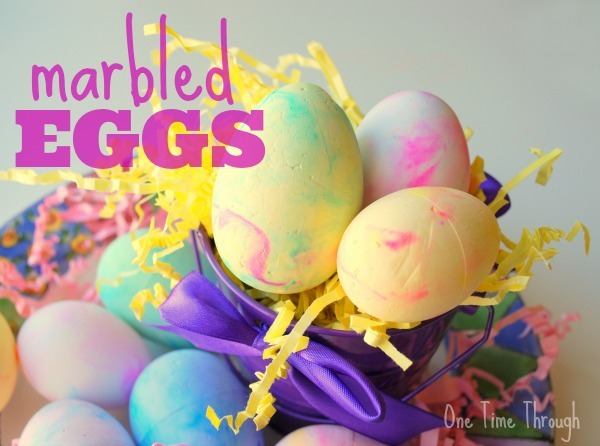 The best part of foam eggs is that they turn out beautifully – all without the mess (and pain!) of having to blow out the yolks! And because we love to mix learning with our fun, we also have a review of the perfect Easter book for you to read with your kids to go along with this activity! 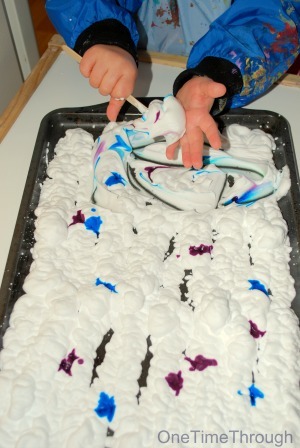 Another fun part about this activity is that it combines sensory play with a crafty creation. 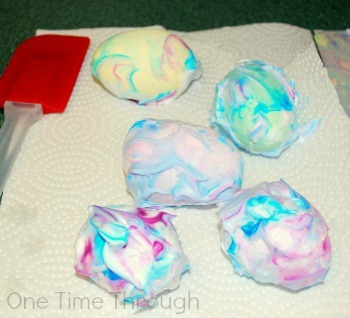 Onetime really enjoyed the messy process of making these eggs and we both really like the pretty products. 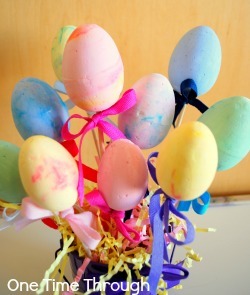 To prep the foam eggs, you will need to give them a base coat of pastel-coloured acrylic paint. I did this step myself, but some kids will enjoy joining in on this part. The second (and messiest) step is to spray the shaving cream all over a cookie tray. Now randomly drop spots of food colouring on top of the cream. We used blue and deep purple. 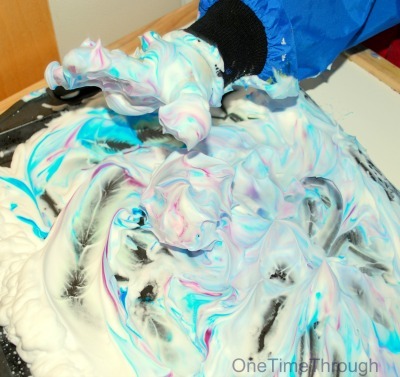 Onetime had a ton of fun just playing in the shaving cream and mixing the colours all around. They get all swirly and pretty! If your kid is anything like mine, you will need to supervise this part closely so that shaving cream doesn’t end up everywhere! Once the sensory play has exhausted itself, bring out the eggs, and have your child roll them in the shaving cream until they are covered. Now set them aside on a paper towel or plate without removing the shaving cream. The eggs turn out much nicer if you let them sit for at least 20 minutes. This lets the food colouring soak into the egg a bit more. In the end, you will have some beautiful swirly coloured eggs! If you want to bring out their colour a bit more and make them glossy, once they are dry, just paint on some Mod Podge. It acts like a shiny varnish (without the nasty fumes!) Our eggs shown in the picture above did not have the varnish on and are still very pretty! Oh – and I almost forgot to mention that you can also make some beautiful marbled paper by just pressing some white or light coloured paper onto the top of the shaving cream too. Our paper turned out very nice! Once you lift the paper off the shaving cream, let it sit for 10 minutes or so and then scrape off the shaving cream with the spatula and let it dry. Okay – now that you’ve got some beautiful eggs and paper, you have to decide what to do with them. So many ways to use them – I’m sure you have an idea that I haven’t thought of (write a comment below – I’d love to hear it!). Why not let your child pick an idea – or ask them what they would like to do with them. Now I also promised I’d have a review of a fabulous Easter book that would accompany this activity perfectly. Here it is. The book is Gail Gibbons’ Easter . I really like how Gail incorporates so much information about Easter into this book – while keeping it easy enough for young minds to follow along with. Her illustrations are always colourful and captivating and Onetime really enjoyed this book as a toddler and now as a preschooler. When we do a hands-on activity like this, I usually like to read a related story before and after – so that Onetime really understands how what he’s doing is related to the bigger picture. 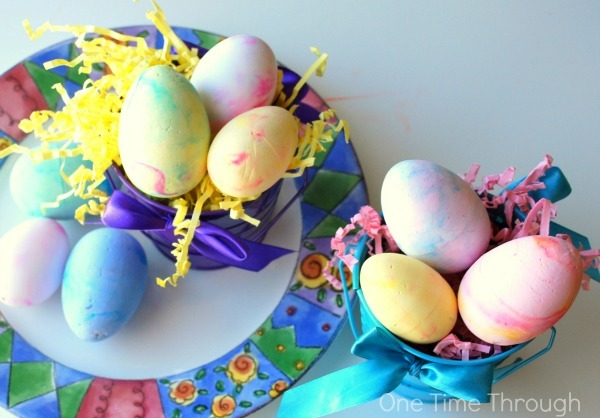 Follow One Time Through’s board Easter Crafts and Activities on Pinterest. Love this craft idea! Worked well for us in past☺ fun and easy! Yep – it’s definitely a FUN one to do!